Juana I, lived in Flanders since 1496 to 1502. Afterwards, she came back to Spain, to become Queen of Castiglia, though she never reigned. Her father, Fernando the Catholic, shut Juana away, in Tordesillas the year 1509. She was considered mad, though this has always been questioned. 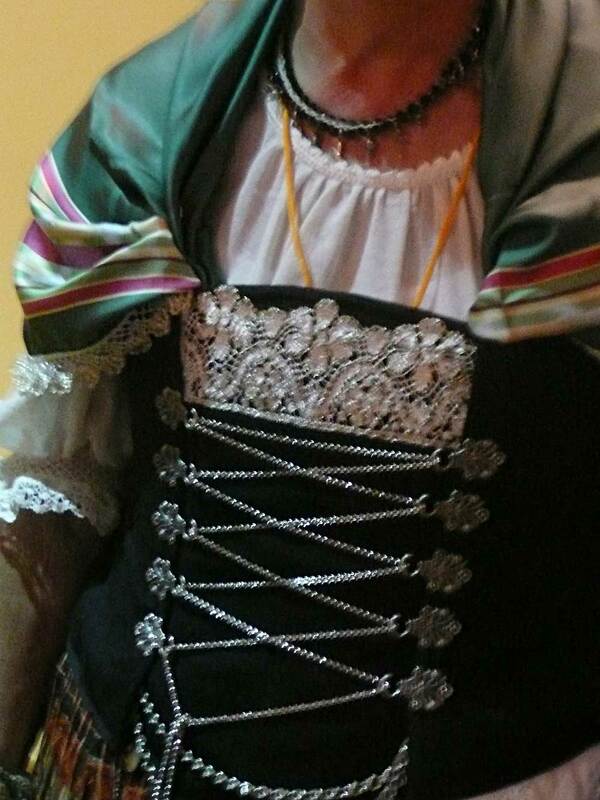 From this year until her death, on Apri1 12th 1555, she never left Tordesillas. 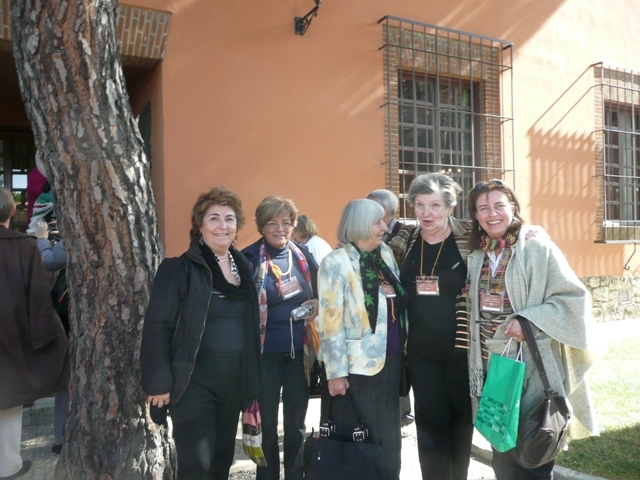 I would like to tell you how much I enjoyed my trip to Tordesillas, together with my Spanish fellow lacemaker Antje Gonzalez, last 17th., 18th. and 19th. October. The trip included a visit to different cities: Zamora, the villages of Fermoselle and Mansilla de las Mulas´. Museums as Museo Etnográfico de Castilla Leon, Museo Didáctico del Encaje de Tordesillas, Saturnino Escuder’s Textile Collection; as well as the exhibitions: 10nth. Context Exhibition of Contemporary Laces, Exhibition of Spanish Mantillas and Belgian coiffes, and Exhibition of typical 16th., century laces. The 10nth. International Congress “Juana I una Reina”, was about the Queen Juana I de Castilla (1479-1555) married with Philippe le Beau, Duque of Burgundy (1478-1506), son of Maximillian of Austria, and the laces made at that time. 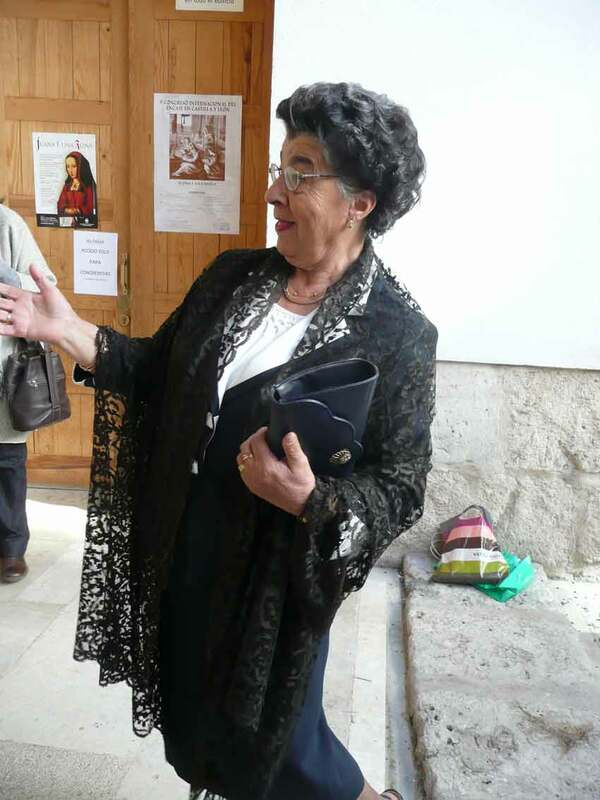 The Congress, organized by the “Museo del Encaje de Castilla León, was in this occasion dedicated to the 50th anniversary of the arrival and stay of Juana I of Castilla in Tordesillas. Why Juana is related to laces? The answer is in the inventory and wills record of 1543. An extensive wardrobe speaks of 90 undershirts, tools for needlelace (point lace) and embroidery, silks, as well as “dechados”(samplers). Without further ado, I am full of impressions which I would like to share with you. Different lace groups, mainly from Belgium, Holland, Germany and Spain were in a wonderful atmosphere, and the aim of the trip. There are documents that give evidence that between years 1479 and 1585, there was a commerce and distribution of laces. Commercial relations, marriages as well as nuns relocated on different monasteries and convents throughout European countries, give some confusion about the origin of those laces. The names that were given to laces by dealers of Spain, Flanders and Italy, made that the meaning of “Puntas Españolas” and/or “Punto de España” was in some way confusing. Moreover, many authors out of Spain, group under this name all Spanish laces: Both bobbin laces and needle or point laces. Though the words in Spanish sound quite similar, they should not be confused. We understand “Puntas españolas”, as early plaited gold and silver insets and passmenteries. These insets, evolved changing their shape one of the sides, first wavy and later pointed, giving rise to the name in Spanish: “Puntas” and “puntillas”, being this last name the diminutive of “puntas” (points). At the same time was added a mesh ground. In Spain, they possibly had a Hispano-Arabic origin. The shape of these early plaited pointed laces, followed the same design as presented the caliphal battlements: a 3 or 4 leaves crest (trefoil) that made it different from those of needle lace made in Venecia. An example of “puntas españolas” (plaited and twisted lace, with geometrical motifs, sometimes worked with colored thread. Another example is, the stone and/or iron filigree endings: The front of the Convent of S. Pablo in Valladolid, maybe representative of the design of this plaited bobbin lace in its simplest form. 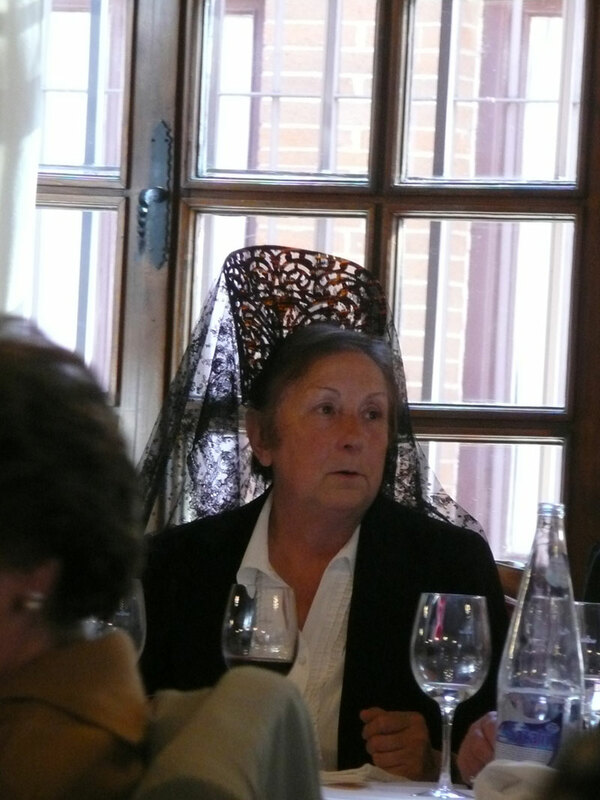 On the other hand, “Puntos de España” were bobbin laces, style Torchon, worked with gold and silver threads. The organization brought us with bus to The “Parador Nacional de Tordesillas”, where we had the banquet. 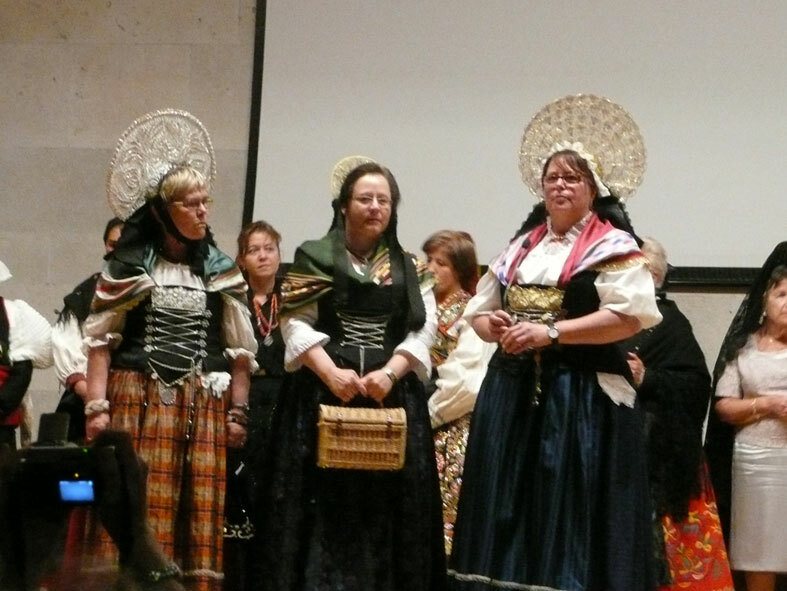 Before entering to enjoy the excellent meal, we had time to chat with other European colleagues, and also to exhibit and enjoy the sight of some of the Spanish and Belgian ladies in their folk dress and coiffes, other in formal dress wearing Spanish mantillas. Click on the pictures to enlarge. We visited the city of León and its magnificent Cathedral:”Santa María de León. It was built on the site of a Roman bath of the 2nd century which, 800 years later, King Ordoño II converted into a palace. It is a masterpiece of the Gothic style dominating the mid of 13th century, by master architect Enrique. 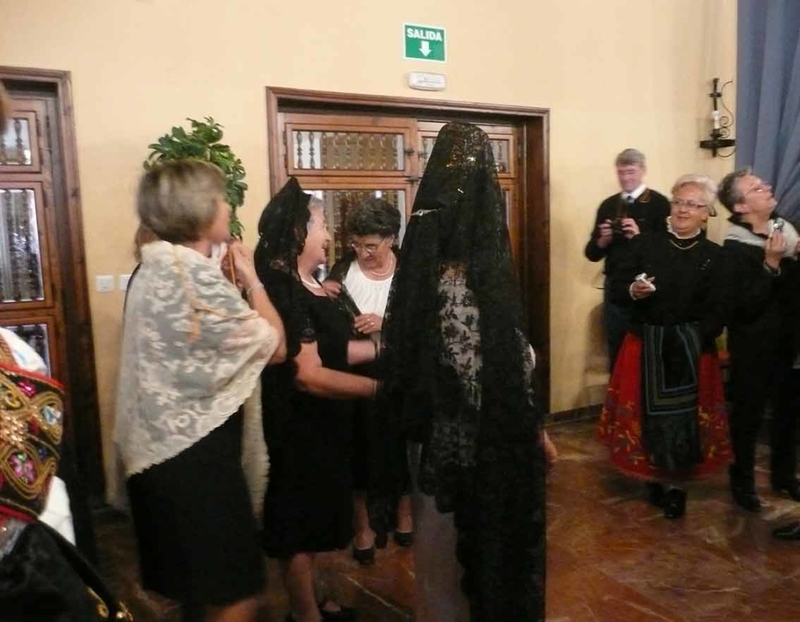 In the Cathedral, The Museum of Saturnino Escudero, presents a valuable collection of fabrics and vestments, consisting mostly of the collection donated to the Museum by Mr Escudero, master the arts of weaving. More than three hundred pieces made up the exhibition. Beside several copes and vestments, mostly 18th. century , we could admire several pieces of Coptic textiles and valuable Mozarabic pieces, as the shrouds of St. Froilan and St. Pelayo. The remaining pieces of damask, silk, canvas, etc., show the history of this genre of art, techniques and forms, for nearly eleven centuries.